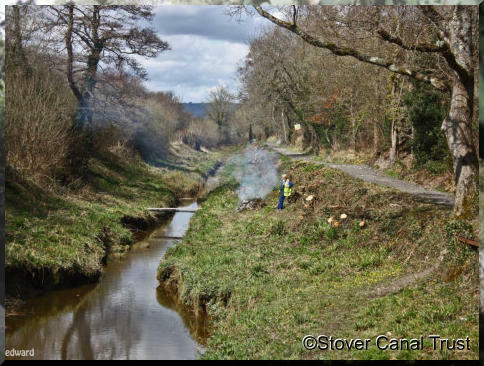 the Stover Canal Trust, was formed, incorporating representatives of the society, Teignbridge District Council, the relevant County, Town and Parish Councils plus other interested parties, to manage the canal and carry out restoration work. In February 2010 the Trust signed a lease on the canal, clearing the way for restoration to begin in earnest. In January 2014 members voted to disband the Society and merge its activities with the Trust. 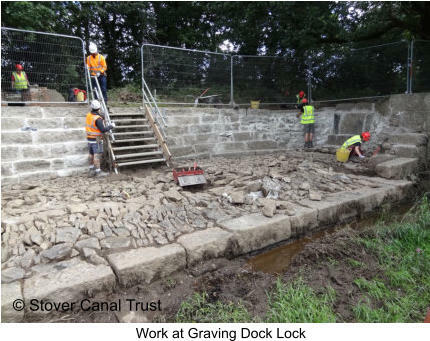 In the intervening years good progress has been made on the physical restoration of the canal, holding monthly Working Parties which have cleared scrub and trees from a considerable proportion of the canal, allowing the extent of the remaining work to be assessed. On the 18th May 2012 Teignbridge District Council granted Conditional Planning Permission for phase 1 of the restoration work. The Planning decision was closely followed by the announcement of £44,000 of funding for the work from the Landfill Communities Fund, distributed by Ugbrooke Environmental Limited through the Viridor Credits. Phase 1 has created a new pedestrian access to the existing Stover Canal towpath at Jetty Marsh by means of an elevated walkway through the bywash arch, the re-surfacing of the existing towpath, the building of a further elevated walkway over the bywash to connect with the path around the Clay Cellars leading to Exeter Road. On the north side of the Old Exeter Road, in the meadow, a connecting path has been created. On the 17th August, 2013 , completion of Phase 1 of the restoration was marked by a ribbon cutting ceremony. The towpath along the canal from Jetty Marsh to the Teigngrace Lock was opened by Mr Justin Templer, a direct decendent of James Templer who ordered the building of the canal over 200 years ago. The public are now able to enjoy a walk along the canal which had been inaccessible for some 60 years. 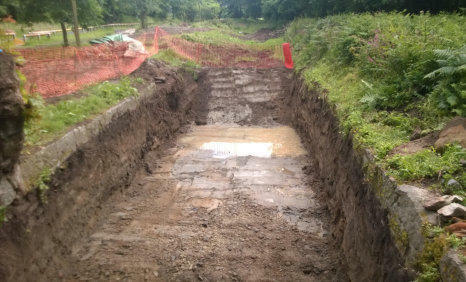 Excavation at Ventiford Basin took place in May 2014 and the remains of a barge were uncovered in the winding hole, where vessels were turned through 180 degrees to make the return journey to Jetty Marsh. The quay walls were also revealed. 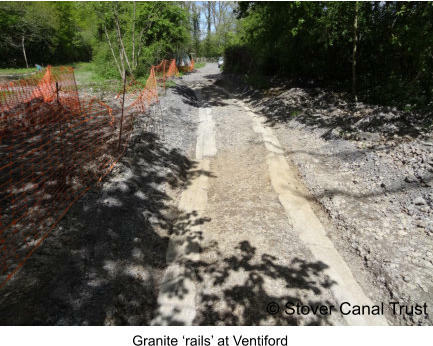 In late 2014, while contractors for Devon County Council were involved in the construction of the cycle and walkway, the Stover Way, evidence of rails from George Templers Granite Railway was discovered. These were further investigated, along with the remains of the barge, at a further archaeological dig in May 2015 . The opening of the Stover Way cycle and walkway from Ventiford Basin to Teignbridge Crossing gives greater public access to the canal features. Plans for Ventiford Basin in 2018/9 - Construction of an earth bank with revetment faces at the southern end of the basin and lining the bed of the basin with a special fabric to enable re-watering. - Introduce interpretation panels, seats and picnic furniture, fencing and safety features We intend to progress similar work at the locks at Teigngrace and Teignbridge in future years as well as working towards rewatering the lower stretch of the canal from Teignbridge to Jetty Marsh. You can keep up to date with our activities by following our Facebook Page. Just click on the logo below. 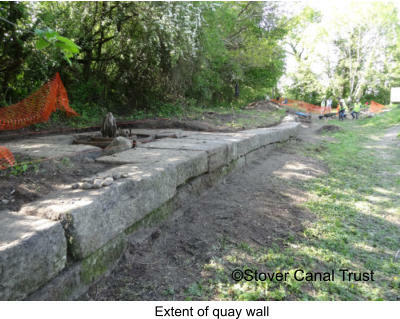 At the end of August 2015 for a period of two weeks, members of the Waterway Recovery Group were on-site clearing the Graving Dock Lock of decades of undergrowth, repointing much of the granite blockwork, rebuilding the boiler structure and improving the footpath alongside the canal. Work continued throughout 2016. During 2016 efforts were concentrated at Ventiford Basin where we received generous help from the local clay company, Sibelco, and some of their staff. Hundreds of tons of silt were removed to expose the original channel. 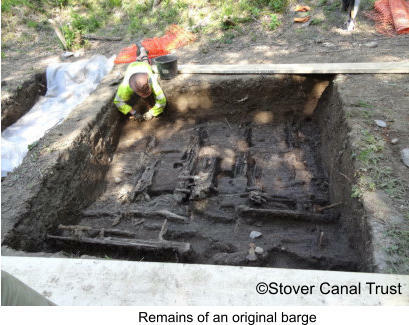 The remains of three more barges were discovered and recorded. 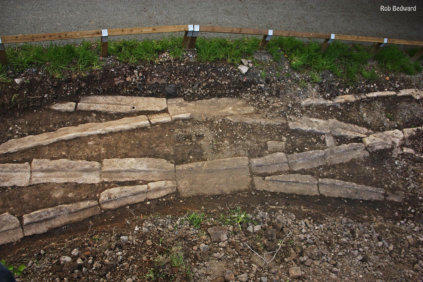 Further lengths of George Templer’s Granite Tramway were also uncovered.